Astronomers have discovered a possible magnetar that emitted 40 visible-light flashes before disappearing again. Magnetars are young neutron stars with an ultra-strong magnetic field a billion times stronger than that of the Earth. In this space wallpaper, astronomers have discovered a possible magnetar that emitted 40 visible-light flashes before disappearing again. 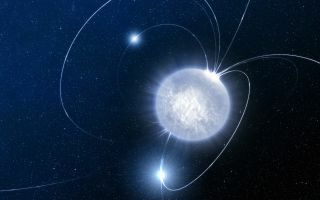 Magnetars are young neutron stars with an ultra-strong magnetic field a billion times stronger than that of the Earth. The twisting of magnetic field lines in magnetars give rise to ''starquakes'', which will eventually lead to an intense soft gamma-ray burst. In the case of the SWIFT source, the optical flares that reached the Earth were probably due to ions ripped out from the surface of the magnetar and gyrating around the field lines.